That’s very aligned with what Copyblogger has taught for years. No matter what kind of writing you do, empathy is what allows you to create powerful messages that move your audience. Whether you fall more to the content marketing or the copywriting side, deep understanding and empathy is the foundation that lets you move — and help — your audience. We often say that content needs personality. It needs a strong, distinctive voice, or it just gets lost in the sea of mediocrity and mush. But can that strong, distinctive voice drown out the voice of the audience? Is it possible to put so much of ourselves into our content that the audience feels left behind? It absolutely is possible. Sometimes you see it on sites (solopreneur sites are a little more prone to this) where the writer can’t quite get over how awesome they are. For content creation, I’ll never tell you to tone down your voice. But I will suggest that you make absolutely certain that your topic matters to your audience … and then make sure that your tone matches the topic. Or Betty Boop’s discussion of a heartbreaking parenting challenge. And there’s a reason William Shatner never got a gig as a spokesperson for … well, for anything sensitive or personal. The more extreme the voice, the greater chance that that voice will be inappropriate for some topics. Getting bland isn’t the answer. Matching the tone to the topic is. I hope you’ve been enjoying Nick Usborne’s posts for Copyblogger as much as I have. He wrote a terrific one recently called How Copywriters Can Leverage the Power of Feelgood Chemicals to Make More Sales. Nick’s premise is that we want our copy to stimulate the brainy cocktail of positive emotion — all of those neurotransmitters that get activated when we feel safe and happy. And I think that’s smart. “Problem-agitate-solve” is an excellent copywriting formula. But when taken too far, it can push a prospect over the line into unhelpful anxiety … and anxious people tend not to take constructive action. On the other hand, we don’t want to be so skillful at making audiences feel good that we enable them to ignore serious problems. If someone is struggling, it’s not a kindness to avoid mentioning it. Let’s use an extreme example. Let’s say you have a business, and every day you come into our Facebook group and talk about how you hate marketing and it’s sick and evil and manipulative, so you’re going to let your business die. It’s not a kindness if I fail to mention that you might have some other options. That you might be able to approach marketing in a way that isn’t manipulative or false or deceptive, and you would get to keep your business. I might even go out on a limb and suggest that selling things, buying things, and processing things isn’t the end of the world. Maybe I’ll convince you and maybe I won’t. But I’m not doing you a favor if I avoid the topic because I think it might make you uncomfortable. So we walk a line. Slamming people into insecurity to exploit them is a horrible thing to do. But we all know from our relationships and friendships that sometimes we have to bring up difficult topics. We can do that from a place of harshness and judgment, or from empathy and kindness. I know which kind of person I want to be around, but not everyone is like me. You have to know your people. 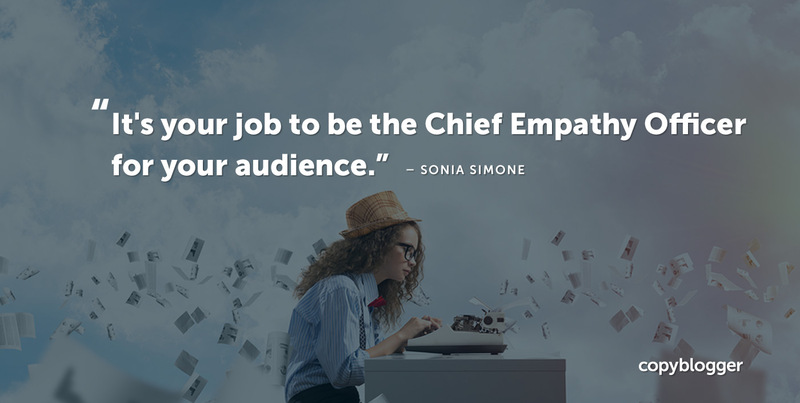 When you write content and copy, your most important job is that of Chief Empathy Officer for your audience. To understand the people you’re serving. To dig and dig and dig into their real problems. To make sure you have real solutions. To express their pain in a way that’s respectful and not brutal. And to communicate that in a way that creates a bond, so you’re working on solutions together instead of shaming or bullying. Do you have any techniques or practices that help you more fully empathize with your audience? My favorite technique Sonia is to remember the pain and suffering I experienced during years of some lean blogging times. I had to unearth some wicked limiting beliefs in regards to money and overall online success; so writing now, being a happy dude, I offer a high energy delivery from a compassionate energy. Excellent insight. Love that Wiebe quote/idea. I tend to mine that same resource, Ryan, remembering how hard it was when I started, and how overwhelming it all was. Creating content with empathy will always ignite a more sensitive side of the reader that will start thinking deeper and more seriously to the ideas exposed in the text. I like running the idea of the post by someone who fits my ‘ideal reader’. If they’re excited by it, then I post it! Yeah, I think you’re right and Nick’s right. There’s a way to approach the difficult queries that always, always put us on the side of the searcher. It’s really a matter of research and defaulting to ‘passion’ points, not pain points. “But enough about me. What do you think about me?”! That’s funny. A few years back I saw the importance of reader-centered blog writing from a Neil Patel post that used a sample paragraph with the words “you” (the reader) highlighted in yellow, and I’ve kept that in mind ever since. There are so many companies that use unethical practices to sell their products. For instance, Big Tobacco used women’s equality struggles to sell cigarettes. It brings shame to marketers, but you have done a great job at explaining how to depict the pain respectfully. It’s tricky to not rub off your audience’s insecurities, while simultaneously having that difficult conversation. But what’s you got to do as an empathy officer, aye?